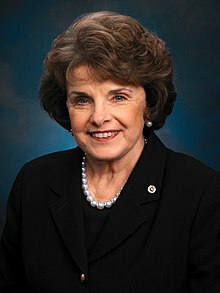 Dianne Goldman Berman Feinstein (born Dianne Emiel Goldman, June 22, 1933) is an American politician serving as the senior United States Senator from California, a seat she has held since 1992. A member of the Democratic Party, she previously was Mayor of San Francisco from 1978 to 1988. Dogma and law are two different things, and I think whatever a religion is, it has its own dogma. The law is totally different. And I think in your case, professor, when you read your speeches, the conclusion one draws is that the dogma lives loudly within you, and that’s of concern. "As president of the Board of Supervisors, it's my duty to make this announcement. Both Mayor Moscone and Supervisor Harvey Milk have been shot and killed. The suspect is Supervisor Dan White." "We’re introducing an updated Assault Weapons Ban for one reason: so that after every mass shooting with a military-style assault weapon, the American people will know that a tool to reduce these massacres is sitting in the Senate, ready for debate and a vote. This bill won’t stop every mass shooting, but it will begin removing these weapons of war from our streets. The first Assault Weapons Ban was just starting to show an effect when the NRA stymied its reauthorization in 2004. Yes, it will be a long process to reduce the massive supply of these assault weapons in our country, but we’ve got to start somewhere. To those who say now isn’t the time, they’re right—we should have extended the original ban 13 years ago, before hundreds more Americans were murdered with these weapons of war. To my colleagues in Congress, I say do your job." (November 8, 2017). Senators Introduce Assault Weapons Ban. Press release. It’s important to understand how we got where we are today. In 1966, the unthinkable happened: a madman climbed the University of Texas clock tower and opened fire, killing more than a dozen people. It was the first mass shooting in the age of television, and it left a real impression on the country. It was the kind of terror we didn’t expect to ever see again. But around 30 years ago, we started to see an uptick in these types of shootings, and over the last decade they’ve become the new norm. In July 2012, a gunman walked into a darkened theater in Aurora and shot 12 people to death, injuring 70 more. One of his weapons was an assault rifle. The sudden and utterly random violence was a terrifying sign of what was to come. In December 2012, a young man entered an elementary school in Newtown and murdered six educators and 20 young children. One of his weapons was an assault rifle. Watching the aftermath of these young babies being gunned down was heartrending. In June 2016, a gunman entered a nightclub in Orlando and sprayed revelers with gunfire. The shooter fired hundreds of rounds, many in close proximity, and killed 49. Many of the victims were shot in the head at close range. One of his weapons was an assault rifle. Last month, a gunman opened fire on concertgoers in Las Vegas, turning an evening of music into a killing field. All told, the shooter used multiple assault rifles fitted with bump-fire stocks to kill 58 people. The concert venue looked like a warzone. Over the weekend in Sutherland Springs, 26 were killed by a gunman with an assault rifle. The dead ranged from 17 months old to 77 years. No one is spared with these weapons of war. When so many rounds are fired so quickly, no one is spared. Another community devastated and dozens of families left to pick up the pieces. These are just a few of the many communities we talk about in hushed tones—San Bernardino, Littleton, Aurora, towns and cities across the country that have been permanently scarred. Many police officers killed in the line of duty are killed by assault weapons, including 1 in 5 officers killed in 2014. (November 8, 2017). Senators Introduce Assault Weapons Ban. Press release. ; "Guns and Groundhog Day". The New York Times. November 13, 2017. Retrieved on September 6, 2018. This page was last edited on 23 December 2018, at 14:42.